Dr. Christensen is a different kind of doctor. She takes time to know her patients. She is dedicated in searching for answers and connections. She listens to what her patients need and champions empowerment by involving patients in all aspects of decision-making and treatment. Dr Christensen recognizes that the person you are today is a result of everything that has happened to you throughout your lifetime starting from conception. Her goal is to promote health and well-being in all aspects of a person: physical, nutritional, mental, emotional and spiritual. Through years of experience both in her personal health and in working with patients, she understands that health can only be reached by balancing the mind-body-spirit. Dr. Christensen earned a four year doctorate in Naturopathic Medicine from Bastyr University in 2001, a BA in Botany from the University of Washington and an Associate in Nursing from Excelsior College. She had a successful naturopathic clinic in Seattle for several years, and also practiced in Chicago. She founded Springs Natural Medicine in 2006. Dr Christensen has years of experience treating many different conditions including auto-immune disease, chronic fatigue, multiple chemical sensitivities, highly sensitive people, thyroid disorders, food allergies/intolerance, chronic and acute pain, gallbladder/liver, digestive diseases (such as IBS, IBD, gastropariesis, etc. ), diabetes, anxiety and depression. While always feeling an affinity towards women´s healthcare, Dr. Christensen’s passion toward pediatrics has grown with every year of practice. She realizes that teaching healthy habits of care to children and families from the earliest age, she could make the biggest difference in the world. She has found that naturopathic care can truly address and remove the cause of the problem and provides safe and effective solutions that promotes a healthy future. Dr. Faith uses the full spectrum of naturopathic medicine to help her patients achieve their health and life goals – from craniosacral therapy, flower essences, gemstone therapy, visceral manipulation, sound healing(the use of sound to heal), herbs and dietary modifications, to supplementation and Neuromodulatory Technique (NMT). She also works with people as part of their health care team accepting referrals for specific manual therapy. She has taught Craniosacral therapy since 1998 through Integrated Bodywork Institute, as an adjunct faculty at Bastyr University and through VIS Medicine. Dr. Christensen has studied with Alain Gehin, DO, Nancy Soliven, MD, DC, Nancy Patterson, ND, LM, Upledger Institute, Alain Gehin, DO and Claudia Kohn, DO. She has published six manuals for various Craniosacral classes, gemstone therapy, Surviving Cold and Flu Season Naturally, and lectures across the country on health and bodywork. Dr Christensen enjoys spending her time outside the office playing with her two children, hiking, gardening, painting(acrylic and watercolor), knitting, cooking and appreciating all that the Colorado Springs area has to offer. 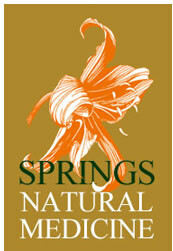 Contact Springs Natural Medicine today to find out if there is a natural solution to your condition(s).